Summary: People expect their banks to operate more like leading technology companies. But, many banks still fall short of these expectations. A Deloitte survey uncovers the gaps and suggests what banks can do to improve. Adobe researched a group of Americans to find out how people think about and access various brands. Community bankers will find it interesting that respondents spend an average 8.8 hours each day engaging with digital content. By age category, Gen Z was tops at 11.4 hours, followed by millennials (10.9), Gen X (8.9) and boomers (7.5). 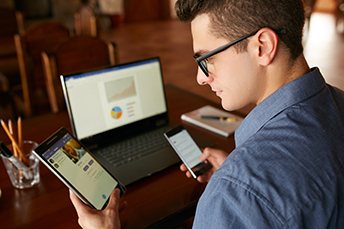 Overall, some 53% said they constantly or frequently used multiple devices, with millennials leading at 73%, followed by Gen Z (66%), Gen X (53%) and boomers (42%). No matter your customer groupings, as the data shows, people similarly expect their banks to operate more like leading technology companies. But, many banks still fall short of these expectations. A survey from Deloitte uncovers gaps and suggests what banks can do to improve. Somewhat expectedly, the survey shows just how differently banks compare to their customers' favorite brands in myriad ways. For instance, 73% of respondents agree or strongly agree that their favorite brand makes it easy to use their products and services vs. only 60% who say the same about their primary bank. Additionally, 70% of respondents agree or strongly agree that their favorite brand "wows" them with the quality of their products & services vs. 45% who say so about their primary bank. Even though this survey addresses consumers, perhaps community banks can use its results to find ways to continue to improve with small businesses too. Of course, one good way to tap into your customers' needs is to continue to deliver a user-friendly app. No matter the number of features, as long as they are the features your customers need and they are easy to access, you are satisfying them on this front. As another option, you could try to find ways to mimic some of the types of interactions favorite brands already deliver. This might include changing up your branch design and making flexible meeting spaces to allow customers to comfortably congregate or work, with self-serve kiosks or onsite banking specialists, when needed. Of course, knowing what your customers want is critical, but as bank customer demographics change, your customers' wants will change too. As such, don't forget to keep talking to customers and asking questions as you evolve your approach. Certainly, you won't want to change too much too quickly. Some hand-holding and additional training may be needed for your more traditional customers as you continue to segue into new digital territory. You may want to start by raising awareness about the convenience of on-the-go banking. Forming partnerships with older adult groups may be one way to better understand the needs of this demographic as well, while teaching them through appropriate channels, such as live classes. Since 92% of traditionalists own a smartphone according to Deloitte, helping to download the bank's mobile banking app and teaching this group of customers to use it can be well-worth the effort. This can be done easily enough with in-branch help. As bankers, we have heard and understand the importance of integrating all channels for a smooth customer experience. Although community bank customers may not expect an extreme level of channel integration, we all know that there is no going back and that the journey continues. The latest survey of business CEOs by the Business Roundtable finds that while plans for capital spending and hiring over the next six months have declined from the prior quarter, they remain well above the historical average. According to the IBM X-Force cybersecurity team, the top banking malware operators are now partnering to spread their malware. These top cyber thieves come from the same areas and run in the same circles so it is easy for them to collaborate. The top Trojans in 2018 were: Trickbot (13%); Gozi (12%); Ramnit (12%); IcedID (12%); Zeus Panda (12%); Dridex (8%); Zeus Sphinx (8%); GootKit (8%); Qakbot (7%); TinyNuke (7%). IBM's Blockchain VP reports that it had preliminary discussions with two US banks about a digital coin that would be pegged to the USD. IBM's new Blockchain World Wire network was just recently announced. It is also working with six non-US banks on digital currencies. The digital currencies can be utilized to settle transactions between customers of different banks. By providing the coins, banks can earn interest income and charge transaction fees.